United Sign: Make Them Want to Pump Your Gas Again! Make Them Want to Pump Your Gas Again! Having an organized, well-labeled, and customer-convenient gas pump at your gas station or convenient store is important for inviting new customers to stop by and especially important if you want them to come back in the future. There are a handful of products that are absolute necessities when it comes to prepping your pumps for customer use. Clearly labeling your pumps or buttons to show what fuel or liquid type is going to be dispensed is very crucial. Everyone wants to know exactly what they're getting without having to think twice about it. If for any reason a customer has to spend more than a few seconds trying to figure out which pump or button is which, it is not likely that they will return to your gas station. Pump product decals are an easy and cheap way to make sure that this will not be an occurrence. 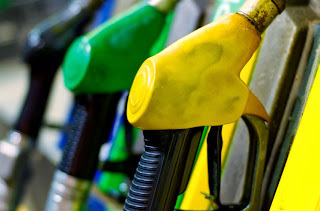 Most necessary safety precautions that need to be taken at a gas pump seem like common sense, but its always best to assume customers know nothing about pumping gas when they come to your station. Having very clear warning and/or instruction labels visible an easy and cheap way to avoid any sort of possible mishaps or misunderstandings. Whether it be a no smoking notice, or a notice about how to properly operate the pump - the easier the experience for the customer, the more likely they are to return! And of course the most important factor any gas consumer considers before they stop to re-fuel is considering the price of the fuel! Making sure you have your fuel types and prices displayed in the best possible locations for easy viewing when a customer drives by is extremely important in getting business. LED signs are very convenient and easy to read, but often extremely costly. United Sign offers TONS of flip gas price sign options that can be customized just for your business, fuel types, and best signage locations. Whether you want a gas price sign mounted up on a high pole or freestanding on the ground close to the street, the possibilities are endless. Having a quick and easy gas-pumping experience is the most important thing you can provide your customers with, but having some extra conveniences is really going to make them want to return! Having a waste container next to each pump ensures a cleaner environment, and keeping a squeegee and windshield service center is a nice bonus for your customers. A clear cap for the pump that allows styrene inserts are good way for advertising your store products and getting your customers to actually come inside instead of just pumping gas and leaving.